Will the new John Lewis festive ad live up to the standards of the agency's previous nine? As if there wasn't enough pressure to live up to the expectations its Christmas ads have set over the past decade, John Lewis has upped the stakes by letting all the other big retailers get their efforts out first. It seems the hype machine may be starting to crank up, after the department store yesterday applied a cryptic twist to its store signage. To further build the festive anticipation, we are recapping all nine of Adam & Eve/DDB's previous festive spots. A folk cover of Guns N’ Roses’ Sweet Child O’ Mine accompanied the first John Lewis Christmas TV campaign by Adam & Eve (which became Adam & Eve/DDB in 2012). The £5m campaign depicted children opening gifts intended for adults, such as a laptop and slippers. The final scene showed a girl becoming a woman. The campaign, which relaunched John Lewis' "Never knowingly undersold" customer proposition, had an increased emphasis on narrative, offering a hint at how the retailer’s Christmas ads would develop. It helped to drive a sales increase of 12.7% over the Christmas period compared with the previous year. In February 2010, head of brand communications Craig Inglis’ contribution to John Lewis’ marketing was recognised by his promotion to director of marketing, nearly a year after marketing director Gill Barr left the company as part of management cutbacks. Later that year, the retailer unveiled a 60-second Christmas ad comprising several vignettes depicting people wrapping presents for loved ones, with one scene showing parents in the background sneaking a rocking horse upstairs while their children watched TV. Ellie Goulding covered Elton John’s Your Song for the spot. This was the year that John Lewis went epic, with a beautifully shot 90-second ad called "The long wait". It starred a boy counting down the days to Christmas so that he could give his parents a gift. Set to the melancholic tones of a cover of The Smiths’ Please, Please, Please, Let Me Get What I Want, the spot, directed by Dougal Wilson, saw John Lewis and Adam & Eve embrace the full-blown narrative approach to advertising, with almost Spielberg-scale schmaltz. The strategy paid off, with the ad proving massively successful online – within days of its launch, it had passed the one million mark online. Sales mirrored its popularity – they were up 9.3% year on year to £596m in the five weeks to December 2011. Love was again the beating heart of the campaign in 2012, despite the ad’s lead characters being far from warm-blooded. In the 90-second spot, again directed by Dougal Wilson, a snowman goes on a quest to a John Lewis store to buy a hat, gloves and scarf for his lover, with the outcome witnessed by a young girl looking out of her bedroom window on Christmas morning. The action takes place with another female singer crooning a minor-key version of Frankie Goes to Hollywood’s The Power of Love. The spot again made a significant impact, accounting for a 44.3% year-on-year sales increase in the five weeks to Christmas and helping Johnlewis.com break through the £800m mark in sales. It was not as popular online as "The long wait", although it still drew a far-from-paltry 3.5 million views on YouTube. Rumours about the creative were drip-fed to a ravenous public (and media), including that the ad would be accompanied by a cover of Keane’s Somewhere Only We Know by Lily Allen. After ITV viewers gained a sneak preview during Agatha Christie's Poirot, when an animated image of a bear was shown with the hashtag #sleepingbear, the following morning saw the full ad revealed and sent Twitter into meltdown. Again. The ad surpassed its predecessors and went on to become the retailer's most popular campaign. Little boy Sam finds a partner for his best friend, Monty the penguin. Adam & Eve/DDB recreated the magic of "The long wait" with a multimedia campaign that included an in-store experience using technology that brought toys to life. Dougal Wilson returned to direct the spot. This real tear-jerker tells the tale of a girl who sends a gift to an old man living alone on the moon. The campaign saw John Lewis partner Age UK. Kim Gehrig directed the ad through Somesuch. The 2016 spot took a more humorous approach. Dougal Wilson returned to direct the ad, which depicts a dog called Buster who finally gets the gift that everyone wants. The film is set to a cover of One Day I’ll Fly Away, recorded by Vaults. The campaign included a number of digital firsts, extending to Oculus Rift, Snapchat and Twitter Stickers for the first time. The spot was shared more times in its first hour than any of its predecessors managed in their first 24 hours. 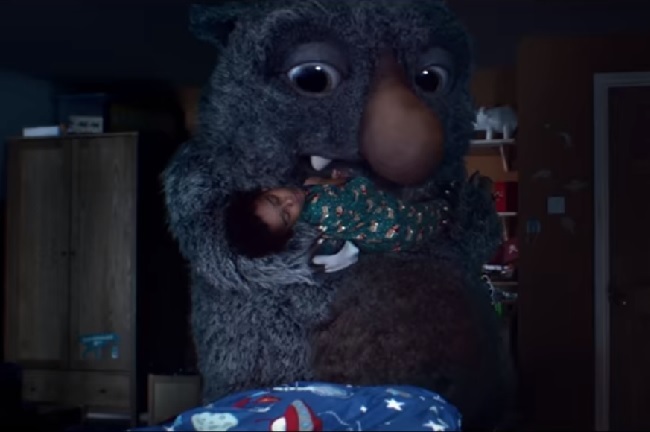 Last year's campaign starred friendly monster Moz, who lives under a little boy's bed and keeps him awake at night. When Joe starts losing sleep after playing with the monster every night, Moz finally delivers a Christmas surprise and lets him get some rest. The soundtrack is a cover of The Beatles’ Golden Slumbers by Elbow and the story was brought to life through a children’s book and digital activations such as a Facebook augmented-reality filter. The spot was written by Patrick McClelland, art directed by Feargal Ballance and directed by Oscar-winning Michel Gondry through Partizan. John Lewis Christmas ad: how has Elton performed? Has the John Lewis ad formula become tired?